Meghan Ritchie, MSN, APNP, joined the Department of Obstetrics and Gynecology in December, 2014. Born and raised in Fond du Lac, WI, she received her Bachelors degree in Nursing from the University of Minnesota in 2006 and her Masters degree in Nursing from the University of Wisconsin-Madison in 2011. 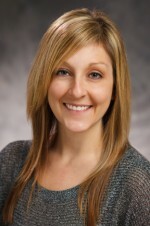 She became board certified in 2011 as a Women’s Health Nurse Practitioner and is licensed in the state of Wisconsin. Prior to joining the Medical College of Wisconsin she practiced at a Family Planning clinic in Milwaukee for 3 years. Prior to receiving her advanced degree she was a Labor and Delivery nurse for 4 years at Froedtert. Meghan’s practice involves caring for women from adolescence onward. She performs routine obstetrical care and sees individuals throughout their pregnancy and after delivery. She also provides routine gynecologic care including gynecologic examinations, contraceptive counseling, management of abnormal bleeding, and a variety of other gynecologic concerns. Meghan sees patients in the Obstetrics and Gynecology clinic at Froedtert Hospital, located in our Specialty Clinics Building, formerly known as Froedtert East Clinics. Outside of the workplace Meghan enjoys spending time with her family and friends. She enjoys running, reading, and cheering on the Milwaukee Brewers.